Therand grew up in Longpine amongst the poor, honest working people. But Therand wanted more, each year the werewolves would come down and feast on the folk of Longpine and the townsfolk would hide in the town’s only tavern, Wolfhouse. One night Therand took a stand (with a bunch of help from outsiders) and the leader was defeated and the attacking Lycanthropes were no longer. Therand has been through some ordeals in his short time as an adventurer. Which includes helping liberate Hluthvar from the vile rule of Vrikus the Ghoul lord, and actually getting himself killed by bandits on a routine patrol. 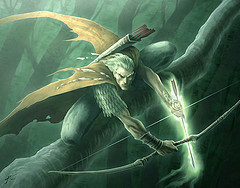 Therand followed Cain Justice to Veltalar to assist with the eradication of the damager’s guild.